NEW ORLEANS – Though this site is EnduranceSportsFlorida, we love experiencing endurance sports outside of the Sunshine State. There are many ways to tour New Orleans. There are vampire and voodoo tours, cemetery and architecture tours, riverboat and streetcar excursions. We’ve been to New Orleans a number of times, but today was our first tour via SUP. 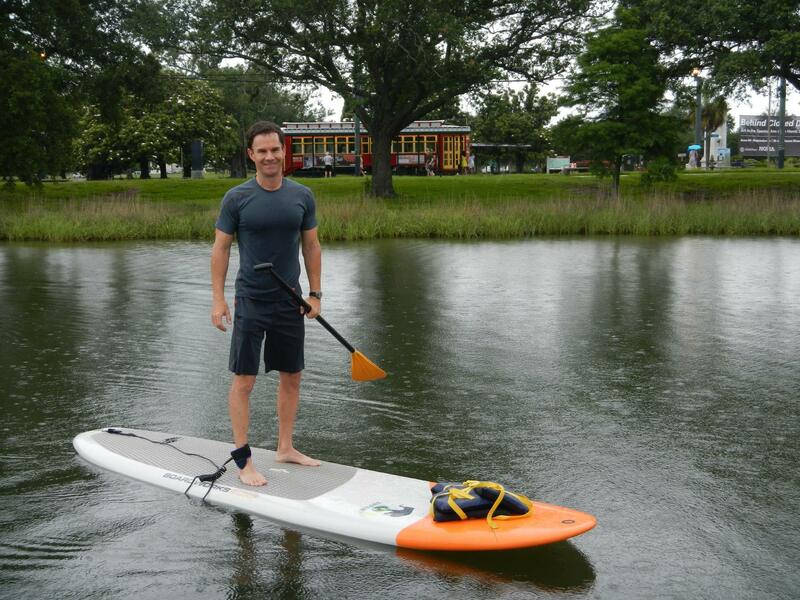 Jeff Lakey established NOLA Paddleboards in 2011 and has built a SUP business that combines lessons, rentals and tours — both out of Lake Ponchartrain and Bayou St. John. I shot him an email a week ago and he set me up with a rental this morning, offering to pick me up at my French Quarter hotel for a (reasonable) additional fee. I took the streetcar instead and it left me off just 50 yards from where Lakey launches boards into Bayou St. John. I figured since I told Lakey I was an experienced paddler, he was just going to rent me a board and send me on my way. Instead, he spent an hour with me and a first-time paddler. We went north and south on Bayou St. John, occasionally ducking under bridges while Lakey pointed out various historic homes and providing insight into post-Katrina New Orleans. When we were done, we hopped out of the water and only had to walk 50 yards back to the streetcar for the ride back. Though NOLA Paddleboards also operates out of Lake Ponchartrain – and soon will open a store there – we highly recommend his Bayou St. John location if you’re visiting New Orleans and staying in the French Quarter. Total cost: $30 for the rental and $2.50 for roundtrip streetcar fare. What a great way to get in a paddle and experience some of New Orleans that visitors rarely get to see.